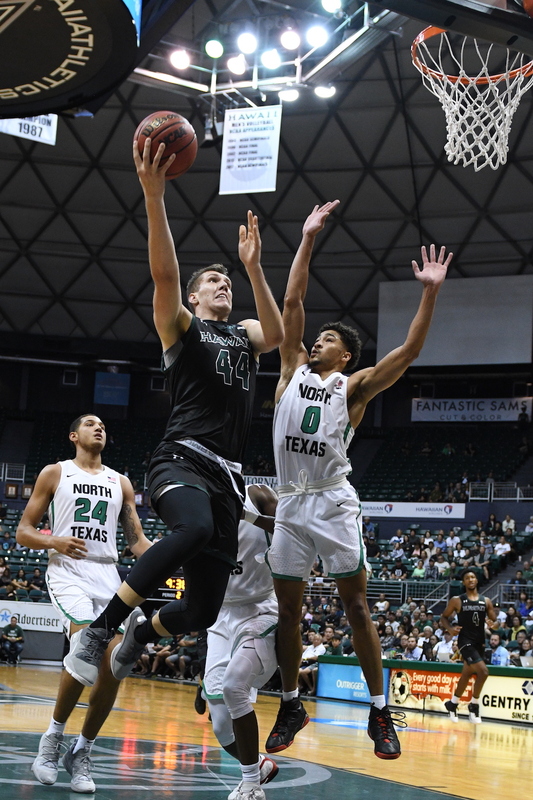 Displaying a stunningly athletic, consistent all-around game and exposing Hawai’i’s lack thereof, visiting North Texas blitzed past the Warriors, 68-51, Sunday evening to capture the Outrigger Resorts Rainbow Classic championship. A hopeful but disappointed crowd of about 4,200 at the Stan Sheriff Center watched Jorden Duffy score 13 points and grab seven rebounds and Jahmiah Simmons add 13 points and four boards as the Mean Green improved to 4-0. Ryan Woolridge added 12 points and eight rebounds for North Texas, which returns six of its top seven players from last season and is expected to compete for the Conference USA title. Zigmars Raimo scored 14 points and grabbed seven rebounds and Drew Buggs added 12 points, six boards and four assists to lead the Warriors, who fell to 2-1. 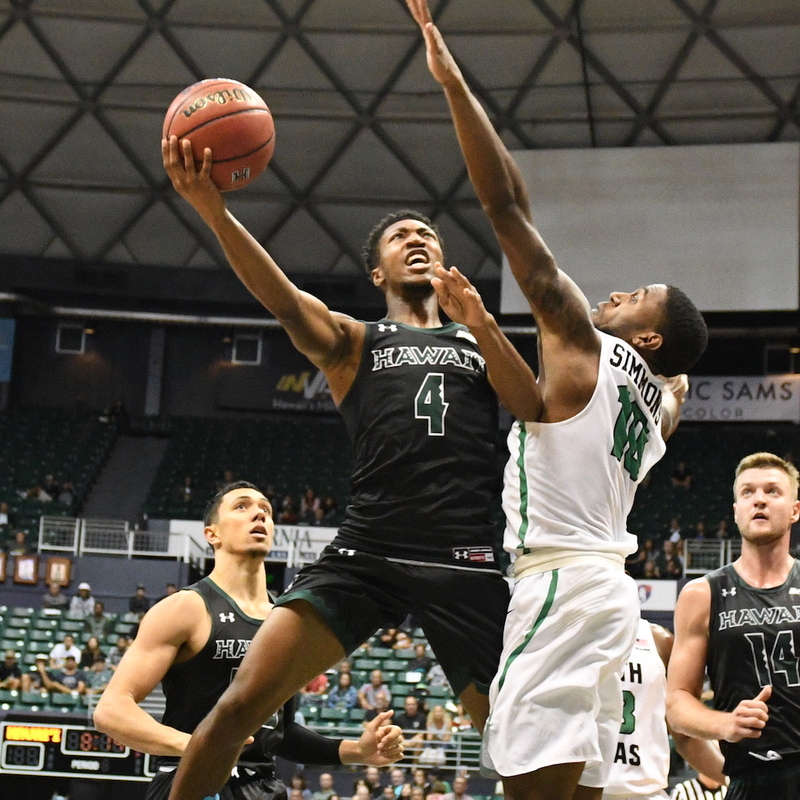 The Mean Green jumped out to leads of 7-0, 12-2 and 17-4 in the first nine minutes and never looked back, as UH struggled to stop dribble penetration, close out on 3-point shooters and provide adequate help defense. On offense, the Warriors missed several open shots from near and far, and failed find any kind of rhythm. 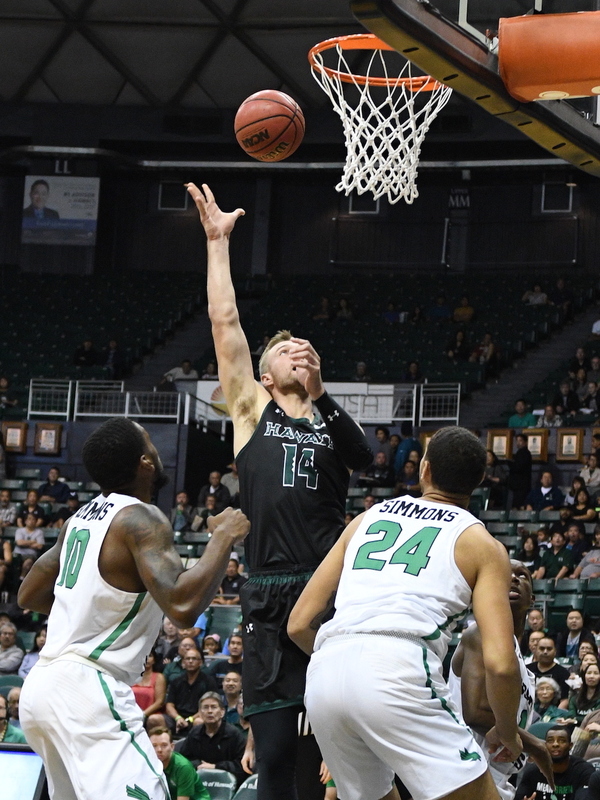 After Hawai’i closed it to 24-15 on Jack Purchase’s two free throws with 4:35 remaining in the first half, North Texas responded with an 11-2 run to head into the break with a commanding 35-17 lead. Purchase opened the second half with 3-pointer from the left wing, but Umoja Gibson answered immediately with his own 3-pointer just 14 seconds later and the Warriors could never close the gap to less than 16 points the rest of the game. “I think you gotta give them a lot of credit, I have a lot of respect for their coach and their program,” UH coach Eran Ganot said. “No disrespect to our guys — obviously it starts with me, I didn’t get our team ready to go, and we were outclassed in every area. I don’t know if we’ve had a 40-minute, basically beatdown, like we did today in every facet of the game. (We) never really made anything happen. Very disappointing, hopefully a teaching moment for us, because you’ll go through a lot of these during the course and grind of the season. We’ll see how we respond, I know we’ve responded in the past. The final numbers told only part of the story: The Mean Green shot 49.1 percent (27 of 55) from the field, compared to just 36.5 percent (19 of 52) for the Warriors. Hawai’i made just 6 of 24 attempts (25 percent) from 3-point range, converted just 7 of 13 free throws (53.8 percent) and committed 17 turnovers (compared to 11 for North Texas). The film showed even more than the book, as Mean Green guards repeatedly blew past Warrior defenders and either finished with uncontested layups or dunks, or dished to teammates for more of the same. Ganot said the Warriors’ lack of help defense only compounded matters. “Our point of attack wasn’t very good, start there — we couldn’t keep them in front,” Ganot said. “And our team defense was atrocious. I don’t know very often, since we’ve been here, that we’ve had guys go one bounce, dunk, with no second line of support. We’ve never done that, and that’s really disappointing … One thing we’ve been pretty consistent with is defending and rebounding, and (tonight) we’re talking about lob dunks, transition, hustle plays … like I said, they beat us in every facet, and that was a big step back for us in that regard. Ganot said his team now must take this lesson and fix it quickly in advance of the next game vs. Northern Arizona at 5 p.m. Sunday at the SSC. “It’s part of human nature, we want handouts and everyone to get us out of this deal … (but) you gotta fight and get yourself out and work together, instead of looking for shortcuts and easy ways out and seeing if you can hide,” Ganot said. “You gotta own what we did today, you gotta be professional and a grown-up about it. If we’re not, and we’re pouting and all that stuff, we don’t deserve to be successful. So that’s the message. We’re supportive of each other, but anything beyond that in terms of getting tougher and getting back to work is not acceptable. North Texas travel so far to come to SSC. Really great point guard. Tireless 5 guys on ball defense. Warriors could not run their offense. Eran has to recruit plain and simple. The BWC is getting better. the top 6 teams, in fact whole league has upgraded talent. My prediction after 2 wins by warriors agains Portland and DII Humboldt St? And loss to small scrappy well coached North Texas? Warriors will lose in semi final of BWC tourney. Finish with overall record ot 16-16. If Matlin has the funds, CIT bid to host opening round game. Only sad part, the attendance for Football and Men Basketball, very much down. I guess the travel, cost and convenience of watching game on TV or listen online. I hope Eran is recruiting roster spots 1 to 15, just have to upgrade talent. Might take a few years, however can be done. I am looking forward to Men’s Volleyball, they might challenge for a final four spot, lot of talent there. Everything for every sport, coaching, fans, interest, good schedule, rpi, and winning can put a few thousand more in seats. In 2018 it is different then 2008 that is for sure, Harder to get 70 percent attendance at any sports venue. Go Warriors. I do hope my prediction is wrong. However Eran has to coach up his team, Up to the DHC their will be 7 teams, that will be really tough before conference play. Go Warriors! Go Bows! Next man up, I am sure Eran will let the best 10 guys play that can help team win ! Coach summed it up nice “We got punk’d”. UNT exposed a lot of weaknesses that UH has. We lack perimeter athleticism and we don’t have complete guards. ^^^ I think getting Sheriff back in the lineup will help. It is basically the same group of guards as last year plus they added a shooter in Stansberry so I think they will improve. The big question is what is wrong with Sheriff? Artie Wilson said he looked ready to play and the team sure could have used him last night.